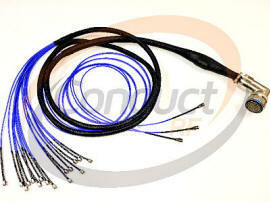 Cable choice include Low Loss Flexible and standard RG styles. Custom marking and also ruggedization coverings including Nomex weave available. Click on the image above to download our D38999 datasheet or contact us at Sales@ConductRF.com or call +1 978 374 6840.